Helping You Provide the Best Care for the People you Love. As you consider someone you love who is now looking to you to help make the decisions for the days ahead, it may seem overwhelming; especially if you still have the needs of your own household or career that require your time and attention. There is no doubt that you want someone who will be attentive to their needs and to the details; compassionate, patient, and a good listener, and will be as committed to them as you are in providing them with the care they need on a daily basis. Our Care Companions have been trained to provide professional care to all our Clients dealing with Alizheimer’s disease or another Dementia. As your Companion in Care, Helping Hands will communicate with you in choosing your care team and will be committed to following the Care Plan you lay out for us. You are invited to join us on Saturday, January 12, 2019, from 10am-2pm at Helping Hands of Cleveland for an informative Workshop for the family caregivers of people with Alzheimer dementia or other dementias. The workshop is also being offered on Saturday, January 19th from 10am-2pm at our Athens location. Many that have been through one of the workshops offered by Helping Hands have said that it has been an eye-opening experience and changed the way they cared for their loved one. It will help provide an understanding of the different types of dementia and the changes that take place in the brain. You will also learn Approach Methods and Physical, Visual, & Verbal Cues; how to handle and cope with Challenging Behaviors; and how to Fill The Day With Meaning. Food will be provided at both sessions. 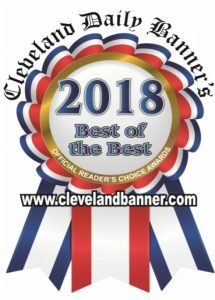 Please register for the event by calling the office or contacting us through the website on or before January 10th for the Cleveland workshop or January 17th for the Athens workshop. Right now is the best time to lay out a plan for the days ahead. You don’t have to face this alone. Who you are and what you like and don’t like are things that are unique to you. The things you like to eat, places you like to go, people you trust and like to be around, and even those you don’t are things you want someone to know about you. Your daily routine can be learned by personal assistants who will make certain that the days ahead are meaningful for you. You will be treated with respect and everything possible will be done to keep you engaged and to work with your decision maker to ensure your well being. As your Companion in Care, we will work with you to develop your care plan. In doing so you will have the confidence that your plans will be followed as your life journey continues. There are times when a little extra help is needed to get through a difficult period, or just to make life a little easier for yourself or someone you love. As your Companion in Care, we will work with you to customize a care plan that will meet your needs in the home, at the hospital or in a skilled care facility. Our rates which include all taxes and insurances are reasonable. We invest in our Care Team, offering them a competitive salary with Medical, Vision, Dental, and Life Insurances available, uniforms, on-going training: e.g. CPR, First Aid, Alzheimers/Dementia Care, etc. We are locally Owned & Operated: drop in visits are always welcome any time the office is open. Exceptional Care Starts with You! Thank you so much for the introduction to my dear friend Charlotte. She will be a “heart treasure” for the rest of my days. She is always compassionate and loving and has a servant heart like our LORD expects of us all. She is a wonderful person and to be highly praised and cherished. Thank you most kindly. I will recommend this service to others always. Thank you for showing the heart of Jesus to the people He loves. Our family is blessed to be a part of the Helping Hands family! I believe Roxanne and Regina know my mom as well, or better that I do! 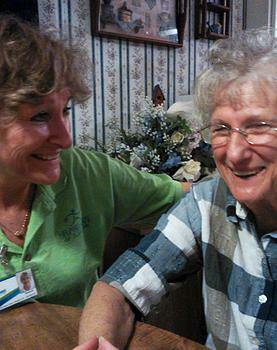 Our caregivers are part of our family, we LOVE them! Please continue to provide love and wonderful care! Thank you! Thank you for your concern and excellent care of Catherine. She always enjoyed your company and visits. Lisa and Regina did a wonderful job with her and provided great care and dignity to her. We are forever grateful for your attentiveness. I have meant to send this article before now. It was really good and I am so happy for you and your business. Fond memories of all you did for our family. Hope you and your family are well! Thank you so very much for the Bible donations made in my Mom’s memory. What a Blessing! Our family cannot say enough good things about the sitters that looked after our Mom during her declining stage of life. Our special thanks go to you and Annie for always working with us on scheduling sitters for Mom, sometimes at the very last minute. Also special thanks to Bertie and Anita…they are angels in our eyes. You and Helping Hands are such a Blessing to our family. Thank you from the bottom of my heart for the service and friendship you are providing for Mom and Dad. It’s always been very difficult for me to live so far away and not be able to be there in person to help them. Knowing that you and others care, gives me peace of mind. I am so very grateful and I appreciate you and helping Hands more than you can imagine. Thank you so much. You’ve really been the best to all of us through this entire journey. I would highly recommend you and your services to anyone in a similar situation. You can’t teach natural love and caring. Thanks again!! There are no words that can express how your company, real people who showed love, compassion, and eternity with our God, can be said. He is in control and I am thankful!! Thank you for what you are doing for people. It is a great Blessing. The Staff has been very caring in care for my Mother and care about my Mother. Many thanks!! Thank The LORD for you and Helping Hands! I love “My Girls!” They, you and the staff are a gift from God. Thank you, SO MUCH, Donna. The level and spirit of cooperation among all of you is exemplary. We so appreciate you! I cannot give HHOC enough accolades!